The Giovene family have been growers and winemakers for over 100 years but the current estate was founded in 1988 and comprises 7 hectares producing about 80,000 bottles per year. Outside of the town of Canelli in Asti, Piemonte, lies the estate of Ignazio and Giuliana Giovine known as l’Armangia. 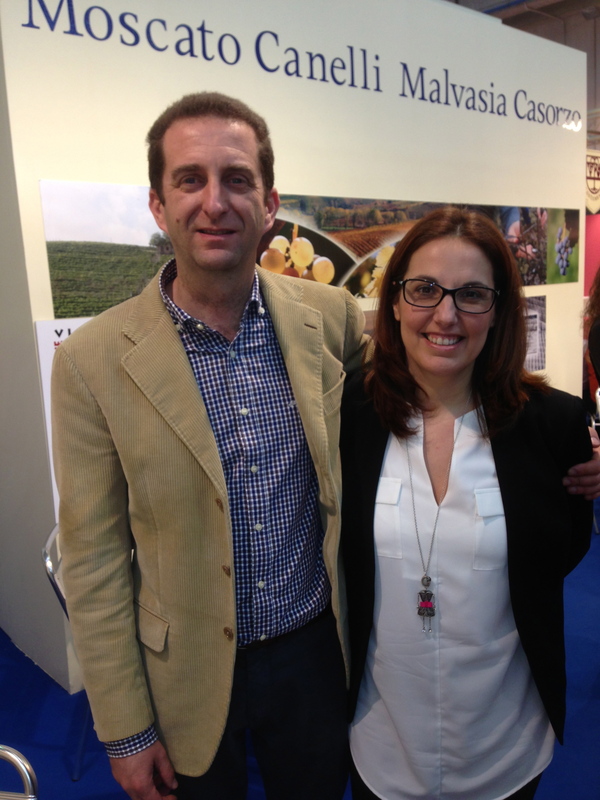 This area has become famous for the quality of their Barbera d’ Asti and Moscato d’ Asti. The vineyards are located on the surrounding hills with SE and SW exposures. The soils are comprised of mostly limestone. Natural fertilizers with grass grown between the vineyard rows keeps things as natural as possible and though organic practicing they are not certified. 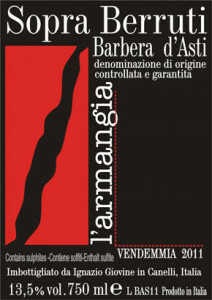 Always estate grown and hand harvested fruit is used to make l’Armangia wine. A non interventionalist by nature Ignazio Giovine believes that it is always best to let nature takes its course and not overly manipulate his wines. All of the grapes are hand harvested and estate grown. 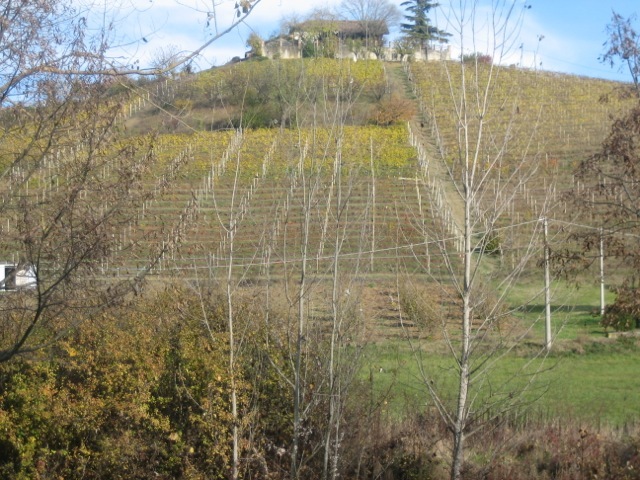 "Chardonnay has been cultivated for centuries in our area – that's why at the beginning of my quest for the best wines to grow in my estate, I decided to create "Pratorotondo", which combines international elegance with its own peculiar 'Piedmontese' touch, and a terroir nose and palate", so says owner and winemaker Ignazio Giovine VINEYARDS The grapes are harvested in vineyards we own, some of them planted back in 1978 at around 170 meters above sea level. With a northwest exposure on a 10% slope, the plots have a prevailingly calcareous soil, which favors water drainage and is poor in organic matter, with alternating strata of sand, tufa and clay. Owing to the low ridges around the vineyards, the sites enjoy many hours of daylight without heat peaks, thanks to their exposure and constant breezes. The grapes are always in a very healthy state, and are characterized by excellent aromas and acidity, that make it possible to delay harvest until the desirable sugar content has been obtained. The presence of Chardonnay Musqué is significant and adds to the bouquet's complexity. THE PRATOROTONDO VINEYARD The main body of the vineyard was planted in 1978 with low-productivity and high-acidity Chardonnay clones. Located on the Sant’Antonio hill in Canelli, the vineyard faces North-West and has a 10% gradient. The low surrounding horizon ensures long sunshine hours, mitigated by constant, fresh breezes. The soil is rich in limestone and marl and highly alkaline, well-draining and poor in organic matter. This is an optimum situation if you want to produce an ageworthy white wine with good acidity and minerality, that is complex and fruity at the same time. HARVEST & WINEMAKING Depending on the year, harvest begins August 26th to Sept. 10th. Vinification takes place partly in oak and partly in stainless steel vats, in variable proportions from 20%+80% to 35%+65%, the percentages being decided on a year to year basis. The wine sits on the lees for 4-5 months at a temperature of 4-6°C. Malolactic fermentation is brought to completion or stopped at the appropriate time, as needed. TASTING NOTES The wine is generally ready for drinking after 16-18 months, although a 2- to 3-year aging period in the bottle enhances its qualities. Pale straw colour increasing in intensity over time. Flowery scents, with banana, honey, vanilla and breadcrust hues. Full-bodied and intense on the palate, never aggressive. Because of its versatility, it provides an ideal accompaniment for fish, shellfish, white meat, grilled meat, flans and vegetables. Serving temperature: 12-14°C. Total alcohol: 13-13.5% vol. Practicing sustainable farming with organic tendencies. Natural fertilizers are used in limited quantities if necessary. A healthy and well-aerated soil, full of microbial life is ensure by permanent grass-growing in between the rows, working the land and the use of sulfur and copper to protect the crops. The Albarossa grapes come from L'armangia's own vineyards, located at an elevation of 250 m asl. The hillside, a 10% slope, has a North-East exposure. The soil is markedly alkaline, poor in organic substances. The site is characterized by a wide temperature range, while the surrounding skyline ensures long exposure to sunlight, causing early ripening. The grapes obtained from this vineyard are rich in polyphenols, sugar, acidity and fruit flavors. This wine has a deep red color (hence the name "iron tinted") and an explosion of fruit on the nose. The beginning of harvest can fall between Sept. 10th and 20th, based upon the weather pattern of the season. 100% hand harvested and estate grown fruit. Traditional vinification in steel and oak vats is immediately followed by the storage of the product in oak casks having a capacity of 2,000 litres each, for a 14 months period. The wine can last from between 5-6 to 8-9 years, depending on the vintage and proportionally to alcohol, colour and acidity. Deep Ruby red with purple tones changing to garnet red after a few years of ageing. The bouquet is remindful of stone-fruit, strawberries, plum and almonds. Tasty and full-bodied, occasionally crisp, it is tannic in its juvenile stage. When young, it harmonizes with red and grilled meat; later, with game, roast and cheeses. This wine is intended as a remake of an old grape blend called "San Marzano." Pacifico was the nickname of the previous owner of these old vines, who was used to livening up local celebrations playing his violin. The grapes come from different vineyards in our estate, mostly having a South-East exposure. The average altitude is around 200 m. asl, while the hillside has a 5-10% gradient. The soil is markedly alkaline, poor in organic substances, draining and mixed with abundant tufa flakes. These vineyards are planted with Nebbiolo, Cabernet Sauvignon, Merlot, Freisa, Albarossa and Barbera, the proportion of grapes from the various cultivars can vary every year, depending on the characteristics of the grapes at the time of harvest, in an effort to keep the sensory profile and quality of the product constant. The beginning of harvest can fall between Sept. 10th and Oct. 8th, based upon the weather pattern of the season. 100% hand harvested and estate grown fruit. Traditional vinification in steel and oak vats is immediately followed by the first racking and by the the storage of 100% of the product in oak casks having a capacity of 300 or 2,000 litres each. A second racking is performed between November and February, based upon the wine's evolution, while the third takes place in late July, the following year. Cabernet Sauvignon Barbera and Merlot are mostly aged in small barrels, whereas all the rest is stored in large casks. The wine can last from 8 to 12 years, depending on the vintage and proportionally to alcohol, extract, colour and acidity. Crimson red changing to garnet red after 5/6 years of ageing. Bouquet of dark currants, violet, with liquorice hues. Complex with a good structure. It displays good tannins and a remarkable balance. It pairs well with lamb, game, red and grilled meat. 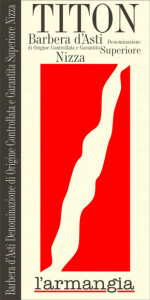 'Titon' is a Barbera d'Asti Superiore Nizza DOCG, produced in a small area of 18 municipalities on the banks of the Rio Nizza. Production regulations from this area set very stringent requirements from both the growing and the winemaking point of view, in order to keep high quality standards. The most important ones concern: vineyard exposure, which must run from South East to South West lower yields and higher alcohol content ageing: 18 months at least (starting from January 1st after harvest), of which a minimum of 6 in oak. The grapes come from different vineyards on the estate, planted between 1934 and 1990. The average altitude is around 230 m asl. The plots have a South-East, East and West exposure, and feature warm temperatures during the day. The soil is markedly alkaline; some plots are rich in clay and poor in organic matter, some others are well-draining and mixed with abundant tufa flakes. The proportion of grapes from the various vineyards can vary every year, depending on the characteristics of the grapes at the time of harvest, in an effort to keep the sensory profile and quality of the product constant. The beginning of harvest can fall between Sept. 6th and Oct. 8th, based upon the weather pattern of the season. 100% hand harvested and estate grown fruit. Traditional vinification in steel and oak vats is immediately followed by the first racking and by the the storage of 100% of the product in oak casks having a capacity of 300, 2,000 or 3,400 litres each. A second racking is performed between November and February, based upon the wine's evolution, while the third takes place in late July, the following year: every time the whole mass of wine is blended together, then 50% is stored in barrels (barriques). In the final stage, all the wine is left to age in large casks exclusively. The wine can last from between 10 to 15 years, depending on the vintage and proportionally to alcohol, colour and acidity. Deep ruby red, with a purple shade at the rim, veering to garnet with just a few years of ageing. The nose is remindful of stone fruit, strawberries, violets, vanilla, almonds, with occasional smoky and mineral notes. On the palate, it is tasty and full-bodied, sometimes supported by good acidity. When young, it displays slightly astringent tannins, but, because of its remarkable structure, it is never overpowered by oak. It provides an excellent pairing with red and grilled meats, game, roasts, cheeses and soups. This wine takes its inspiration from Asti's traditional Barberas, which are generally rich in bouquet and colour; although sometimes with a lovely acidity on the palate, they are a perfect accompaniment for local dishes, including processed meats and cheeses. The grapes come from different vineyards located on the best hills of our area. Generally the location is 'above the Berruti family property' hence the name - 'Sopra [above] Berruti'! The specific proportion from each vineyard varies every year, based on the analytical composition of the grapes, in an effort to keep the sensory characteristics as well as the quality of the product constant. Depending on the season's weather pattern, harvest usually begins between September 10th and October 3rd. Immediately after standard vinification in steel at 26° C, 20-30% of the product is stored in oak and the the remaining part in steel tanks. Approximately 6 months later, the two batches are blended, then completion of malo-lactic fermentation is allowed, followed by a period during which the wine is left to settle naturally before bottling. This wine can age from 4 to 7 years, depending on the structure, colour, alcohol and acidity specific to each vintage. Ruby red with purple tinges, changing to grenadine after a few years in the bottle. Intense stone fruit (mostly cherries), strawberries, violets, occasionally almonds. Tasty and full bodied. Enjoyable acidity, light but clear tannins, softening with ageing. Best with red and grilled meat, charcuterie and cheese, soups and venison; an ideal match for fat and tasty dishes, which highlight its "mouth-cleaning" properties.